NEW YORK (AP) — Who needs a kicker? Apparently not the Los Angeles Rams. As for the Browns and Vikings, who are going with untested youngsters, well, maybe a new guy to handle field goals and extra points will be employed soon. Sure, it’s kind of early to panic about placekicking. The Rams showed how to not rely on placements once Greg Zuerlein went out Sunday with a groin problem. They simply scored touchdowns and then went for 2-point conversions, making three. Still, when it’s early in the schedule and kickers are struggling — there were seven missed PAT kicks Sunday afternoon — despite generally decent conditions, that’s troubling. Minnesota rookie Daniel Carlson twice went wide right on overtime field goals and the Vikings tied top NFC North rival Green Bay 29-29. Even though Packers kicker Mason Crosby matched a career high with five field goals, his potential winner from 52 yards went wide left as time expired in regulation. It’s rarely wise to play for field goals, particularly when you have the two highest-paid quarterbacks in the league, Aaron Rodgers and Kirk Cousins. But circumstances sometimes dictate not gambling. In Green Bay’s case, that pretty much paid off thanks to the veteran Crosby. Not so much for Minnesota as Carlson missed from 49 and 35 yards in OT. He also failed from 48 in the second quarter. Zane Gonzalez , who held FBS records for career field goals made (96) and points by a kicker (494) when he left Arizona State after the 2016 season, hurt his team even more. His Browns lost — yeah, that’s hardly news as it was the 18th time in their last 19 games they flopped, and the other game was last week’s tie with Pittsburgh — and he missed two field goals and, ugh, two extra points. 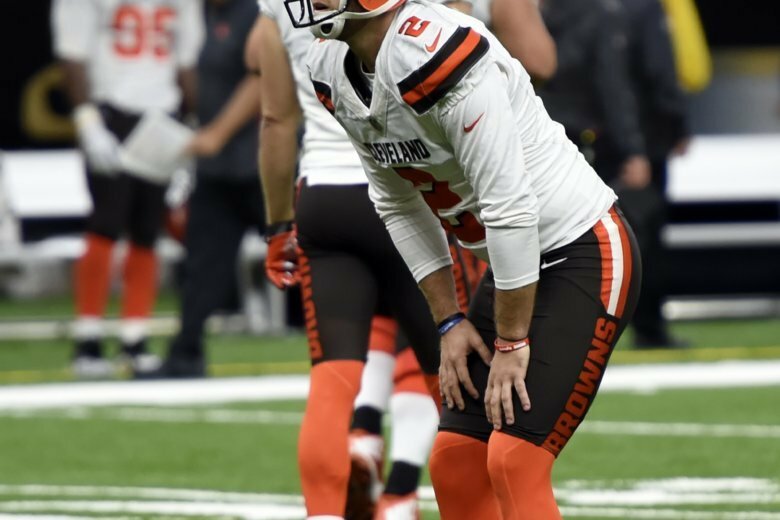 He botched his first extra point after the Browns went up 12-3 in the third quarter at New Orleans. He was wide left on a 44-yard field goal that would have given them a 15-3 early in the fourth quarter. That plagued him on his final two attempts. Gonzalez hooked an extra point wide left with 1:16 remaining, leaving the score 18-18. He pushed a 52-yard field goal try right with 3 seconds to go after the Saints went ahead on Wil Lutz’s 44-yard field goal 18 seconds earlier. “It was on me a hundred percent,” Gonzalez said. “I can’t blame it on anybody else. We were so close to that win and it’s been so long, and I just let everybody down. Gonzalez missed one extra point last season as a rookie in Cleveland. Miami’s Jason Sanders and New York’s Jason Myers were both wide on PATs in the Dolphins’ 20-12 victory over the Jets. Pittsburgh’s Chris Boswell missed an extra point against Kansas City in a loss, and Tampa Bay’s Chandler Catanzaro did so, as well, against Philadelphia in a victory. The NFL’s decision to move the extra-point kick back to the 15-yard line has turned it from a gimme into, well, a lengthier putt. Hardly, though, a twisting breaker like at Augusta National. With kickers bombing field goals from well beyond 50 yards with regularity — Myers, who has a spotty record on PATs, tied a Jets home mark with a 55-yard three-pointer — and coaches willing to let them try, what’s up with the 33-yard extra point? It brings up an interesting possibility. Consider what the Rams did without Zuerlein; of course, they have one of the NFL’s best weapons near the goal line in Todd Gurley. The running back and 2017 Offensive Player of the Year scored twice on the 2-point conversions from the 2-yard line. And the Steelers rarely back off from trying for the deuce. Who would mind having Tom Brady, Aaron Rodgers or Drew Brees overseeing one play from the 2 for a couple of points? Or Cam Newton or Russell Wilson getting creative in that goal-line situation? So maybe teams unsure of their kickers’ reliability — ignore this, Ravens and Rams and Colts fans, for example — will think more about the 2-point conversions. That would be a major culture change, as would not thinking so much about setting up field goals. Seems coaches get burned a lot by that philosophy. Why not get really radical, NFL, and simply eliminate the PAT kick altogether? All 2-point conversions all the time.